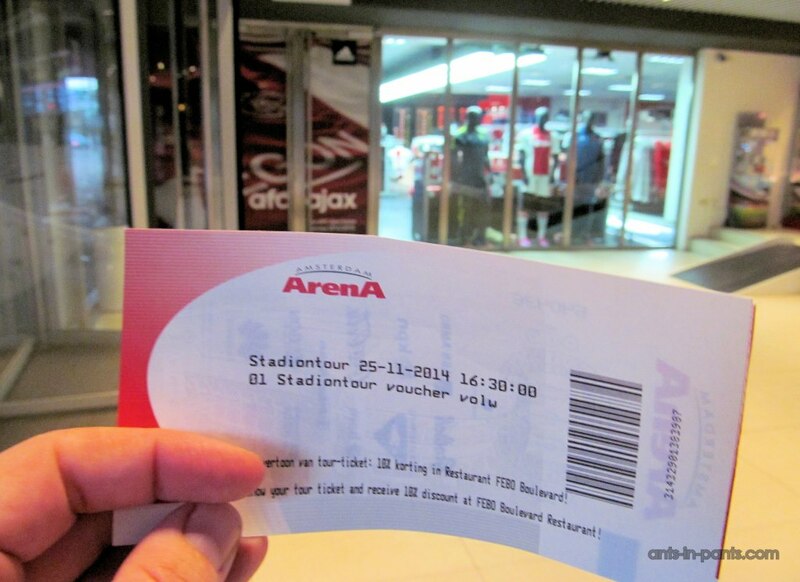 In this post we will talk about Amsterdam Arena Tour as a continuation of Vitya’s Amsterdam stories. 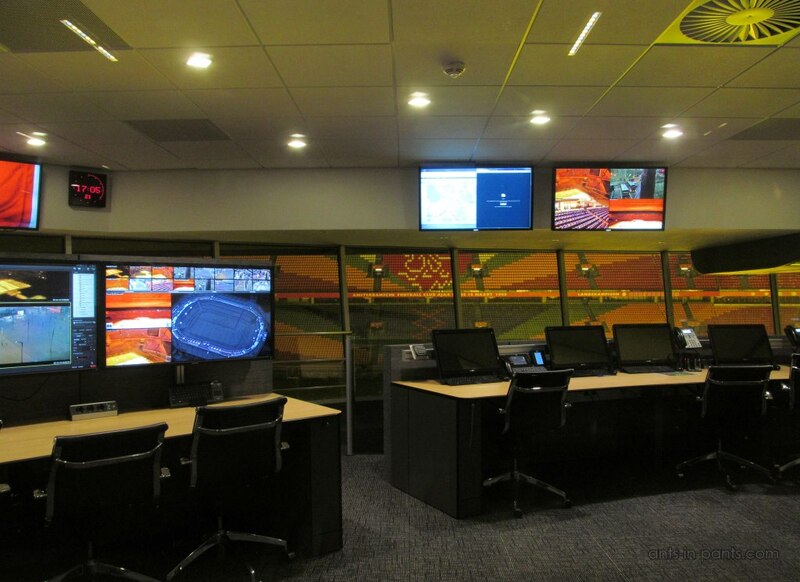 Stadium Tours start 8 times a day from morning till evening. However, you must ensure that there are no games or team training during the time you are planning your visit. To check the schedule and buy tickets in advance go to the official page of the Arena. 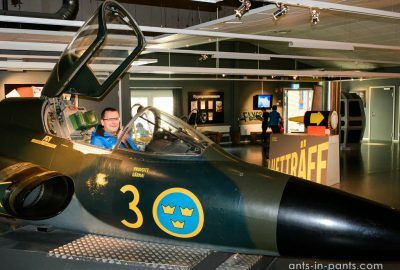 The tour lasts for more than one hour, and the price is 14.5 euros for an adult and 9.5 euros for a child. The stadium is easily accessible by public transport, in particular, by subway. More information about the transport system in Amsterdam has been described in the previous post. Take the lines 50 and 54 till the stop Bijlmer Arena. It takes around 15 minutes from the city centre. 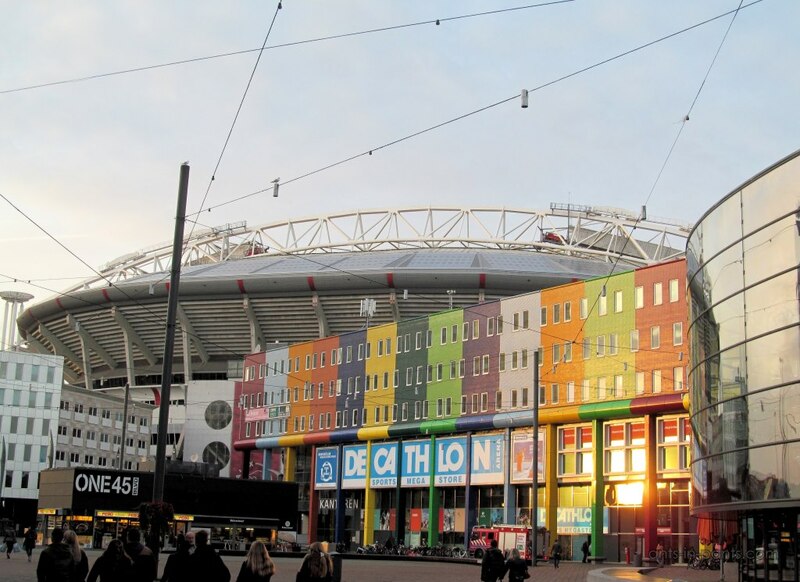 Then you need to walk for about 10 minutes, even though you almost immediately see the stadium behind the funnily painted houses. This is because you need to make a half circle around the stadium. You must come at least 10 minutes before the tour starts (the official recommendation) and take a printout of your reservation with you. At the reception, staff will change it to a normal ticket. One more nuance: do not plan your visit to the Arena when it is dark. Why? You will find an explanation below. At the appointed time, a guide came in and brought our group to the small cinema, where we watched a short video. After that, we went to the pitch. 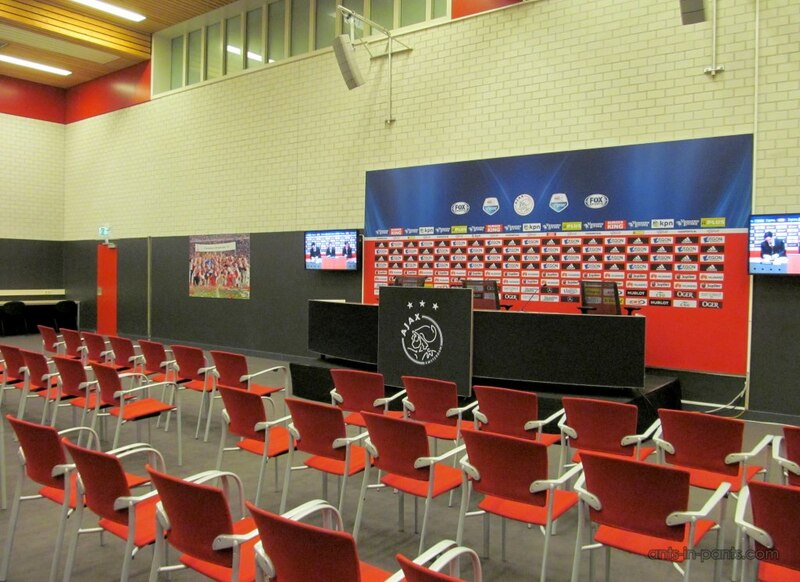 On the way we got information about the football club Ajax and its stadium. 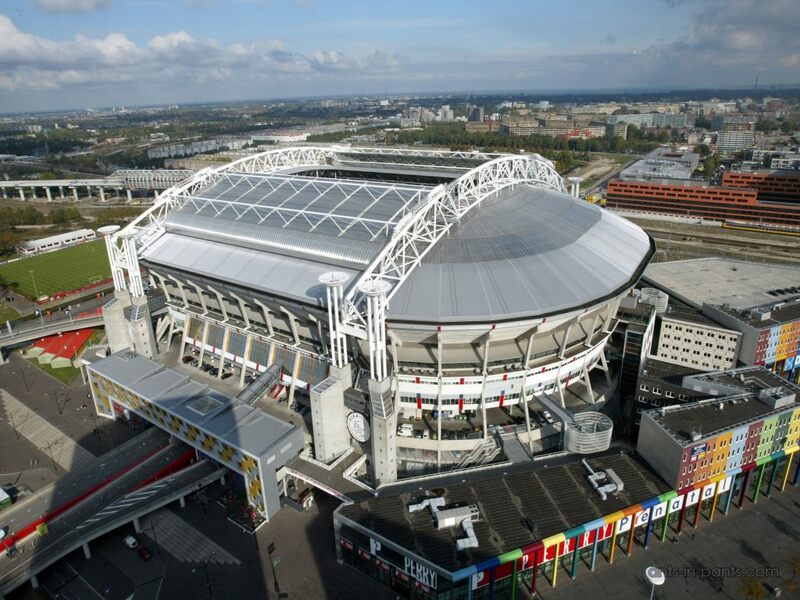 In fact, the stadium is owned by the city, not by Ajax. It is not only designed as a sport ground: it also hosts a variety of cultural events, from concerts to the wedding ceremonies. 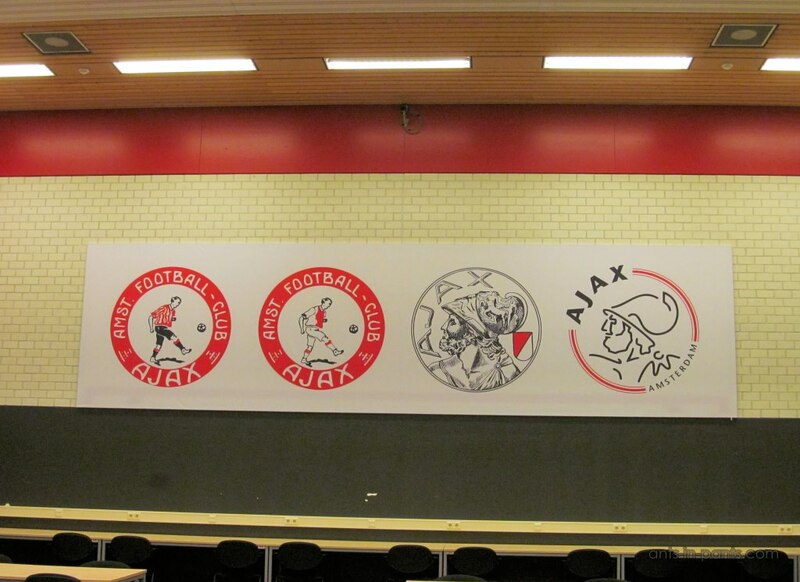 Football club “Ajax” was founded in 1900. The club borrowed the name of the legendary Greek hero. Consequently, the emblem was adopted in accordance with meaning. You can see the process of logo transformation below. In 1917, the club has made the first significant success winning the Dutch Cup, which was followed by the championship in the next season. Thus, football club Ajax became the most titled club of Holland. 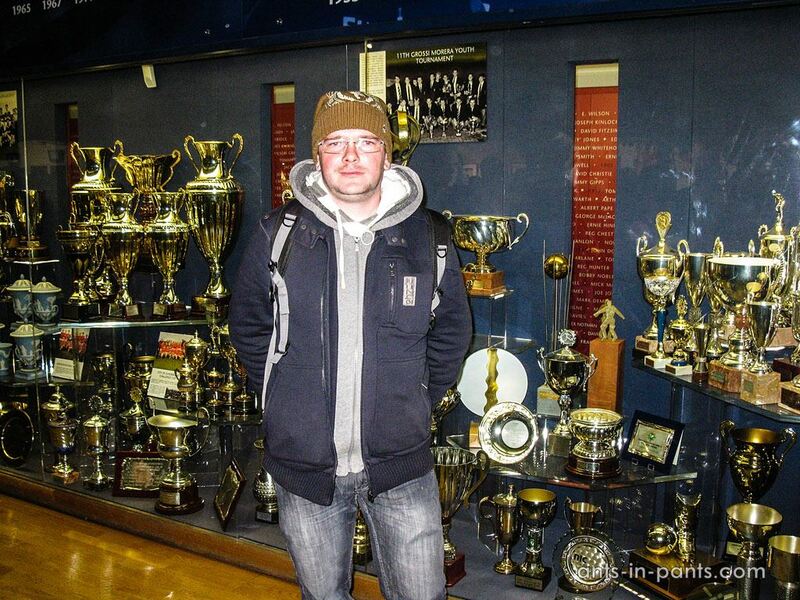 It won 33 Championships title and 18 the Holland Cups. FC Ajax has achieved valuable results at the international level: it is a 4 times Champions League winner and 3 times Super Cup winner. The club has one victory in the UEFA Cup and Cup Winners Cup. 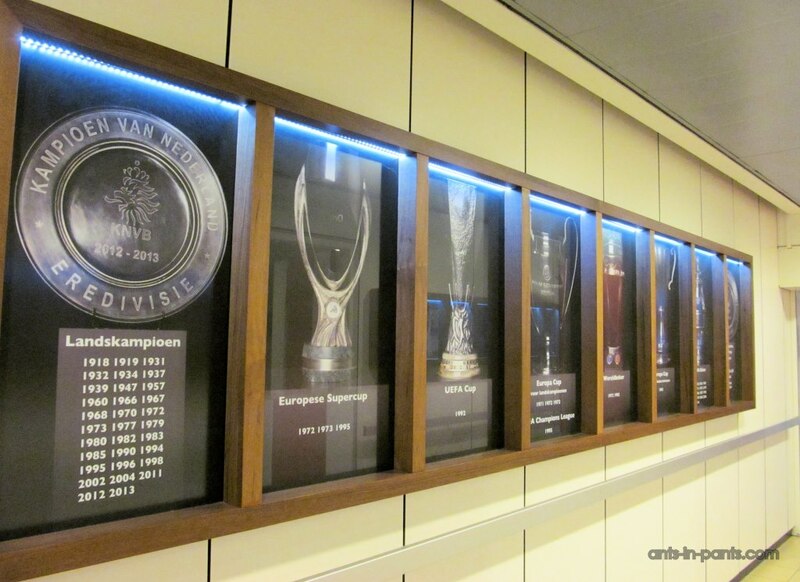 The reminders of all of these achievements are posted in the hallway not far from the dressing rooms and near the door through which the teams go to the pitch. An attentive reader may have noticed that both posters indicate only 32 champion seasons, the last triumph in 2014 was not yet taken into account. 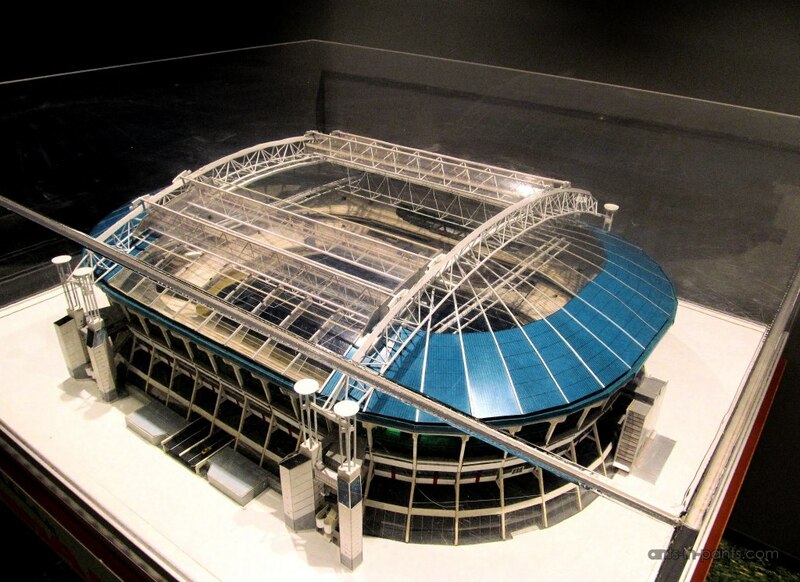 The stadium is relatively new, its construction began in 1993 and very soon the object was opened by the Royal family in 1996. 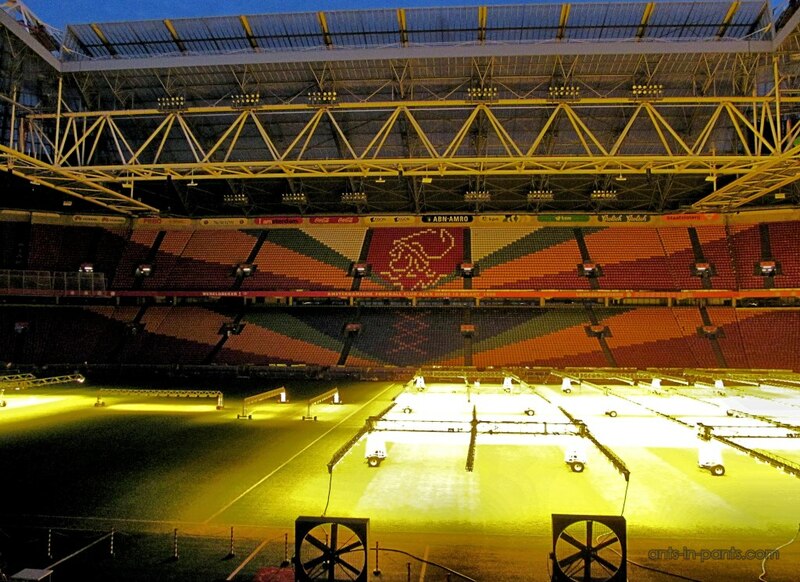 Amsterdam Arena is primarily known for its high stands and a telescopic roof. This design was used here for the first time. I didn’t have helicopter to take a picture of it from above, so take a look on its model. Because of the high stands and the roof, however, a big problem appeared. Grass did not receive the required amount of light, losing its properties and having a bad appearance. The pitch was changed for up to 8 times a year. And then another technology solved the problem. It came from science, namely, agriculture. Now grass gets necessary amount of light and energy thanks to the artificial sources of sunlight. 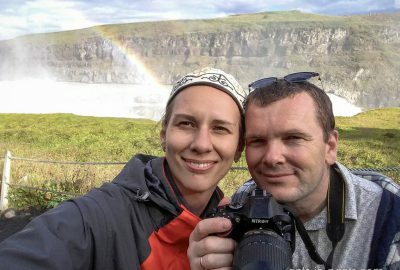 The only drawback of it is for tourists: the know-how hinders to take quality pictures during their operation, especially from the regular camera in the darkness. That’s why I would recommend plan the tour for the daytime. 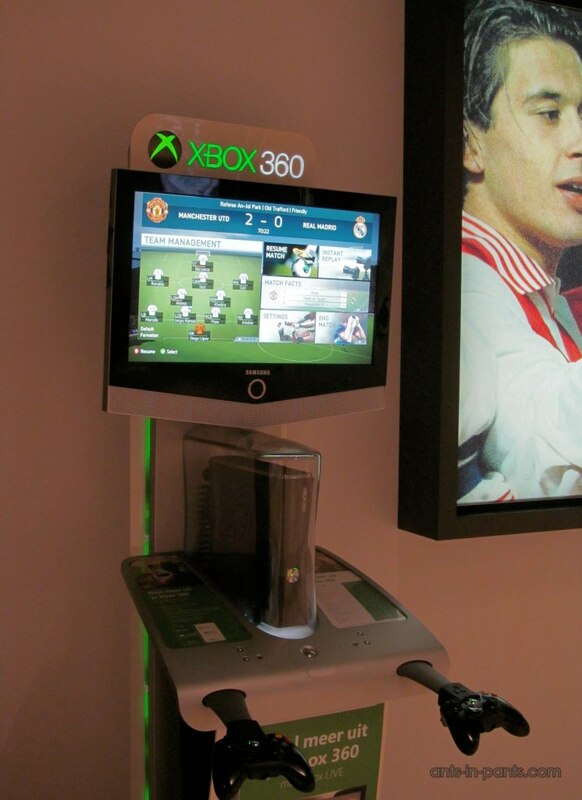 Currently, this technology is also used in other stadiums I visited. These are a few photos helping to evaluate the effect of lighting on the picture. 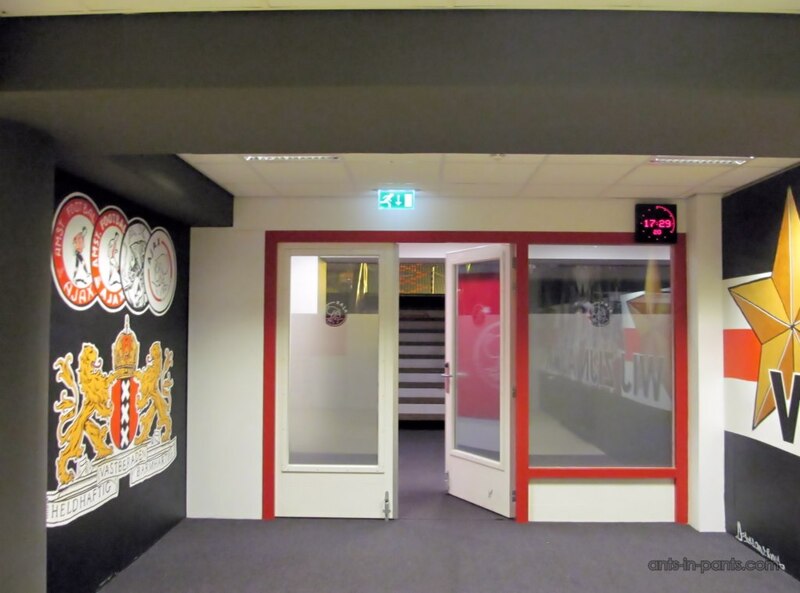 On the way, we were told about the history of the club and the stadium, the players and fans. 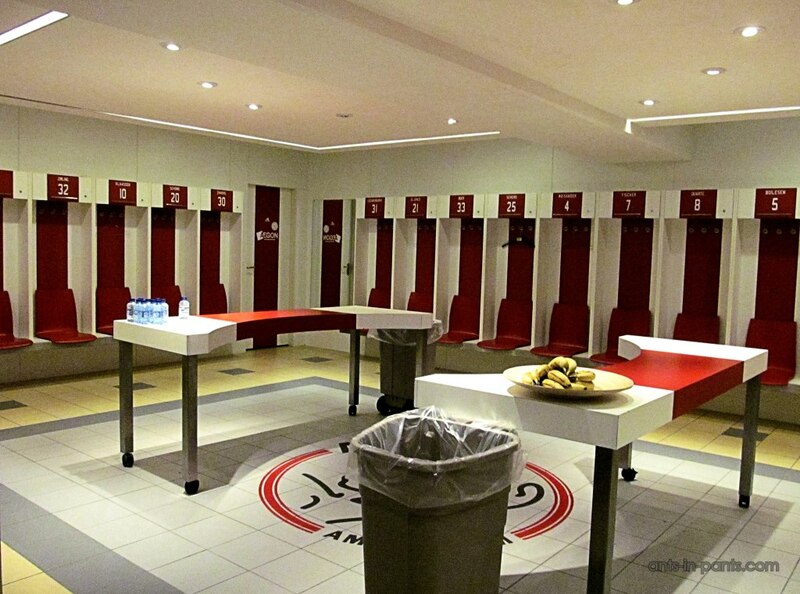 A football lover knows without my help all the great players and coaches of FC Ajax. I don’t want to blow up the minds of those readers who are not interested in it by retelling that. The coloring of the stadium looks strange. 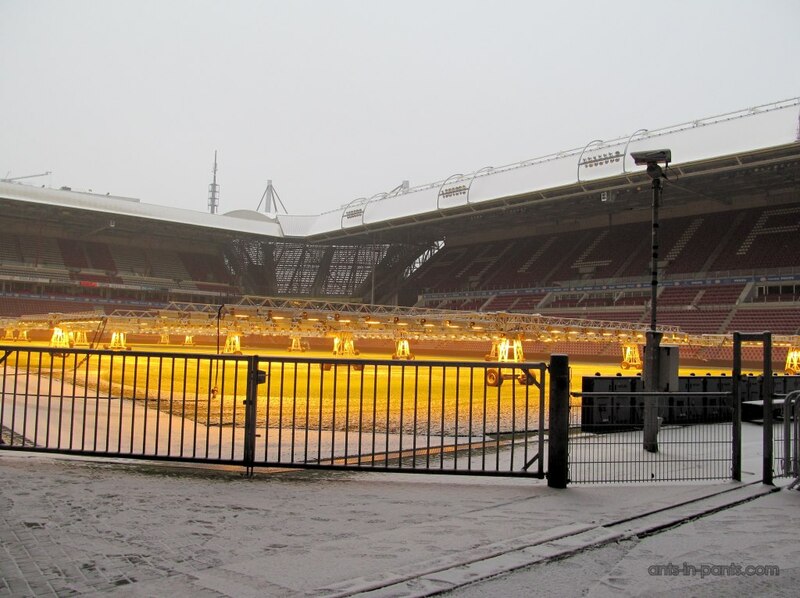 Usually stadiums have colors of the club, but here it is much more than the club’s red and white. The explanation is simple: coloring is paid by sponsors. Another thing I’ve found amazing is how visiting fans are placed at the stadium. Apart from the common practice that their sector is isolated by a strong glass or bar, they also have a separate entrance to the stadium, and, if I understood correctly, even a separate train station. It allows to eliminate contact with the local fans. The latter are quite well known for their temper – especially VAK-140, which occupies the upper tiers. The famous Skybox is placed upstairs. This is the place from where the control over the whole arena is organized. By the way, the stadium has around 130 cameras, which, according to our guide, even let the security see what kind of text message a fan writes if neccessary. Here also the retractable roofs control is performed. 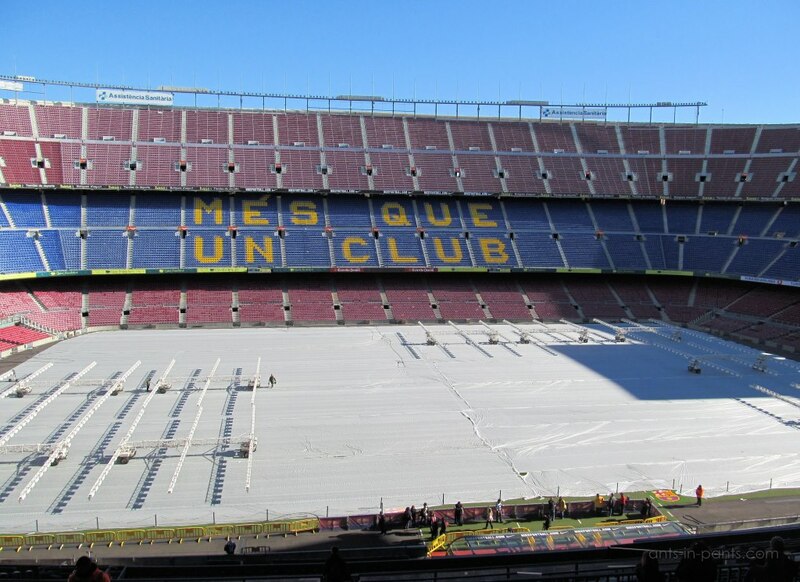 Three hours before the start of the event there is an official meeting taking place with a decision following – to open or to close the roof for this particular game. Then we went down the steep stairs and found a room where press conferences are held. Anyone can take a picture on the chair of the head coach. Aftewards we took a look on the dressing rooms. Through the same corridors the players take we went to the door that led back us to the field. The last point was the mixed zone where the players give post-match interviews. We passed it quickly and came back to the escalators leading to the reception. Unfortunately, the museum of the club doesn’t exist. Whether this is due to the fact that Arena belongs to the city, or for any other reason, I could not figure out. Our guide only said that there are plans for the opening the the museum. 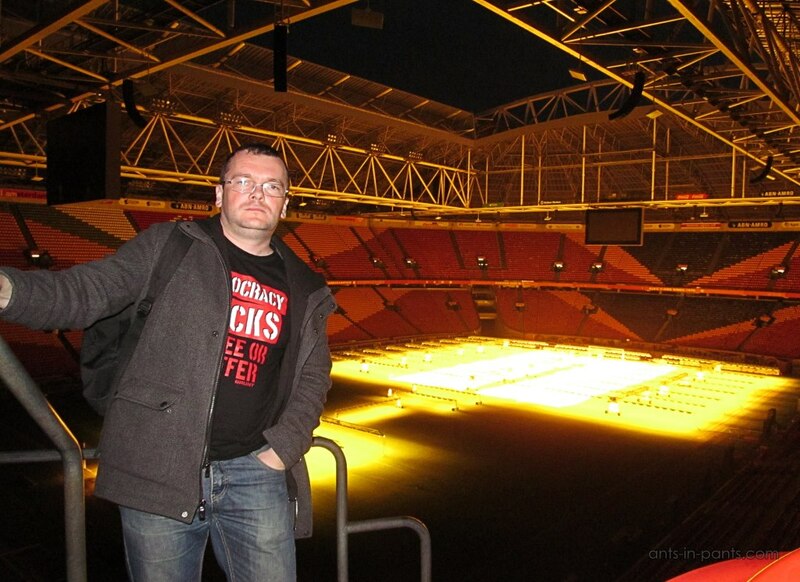 That is all what I saw and learned during Amsterdam Arena tour. Next time I will share with you Heineken Experience, but before we promise to tell start telling about our month in East Africa we just came from!